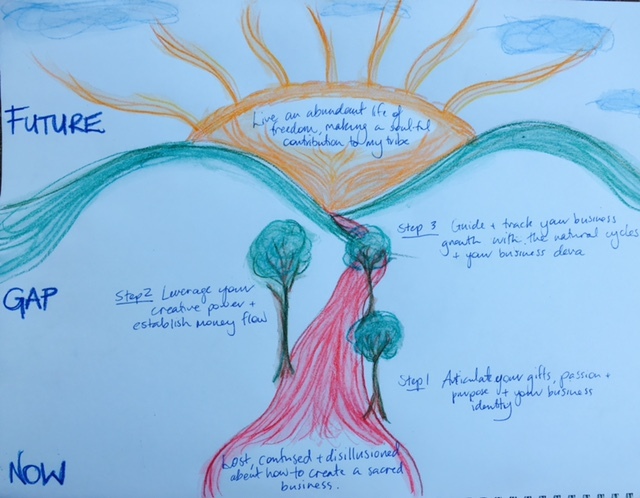 The purpose of partnering is to give and receive feedback from one of your peers on the different elements of your Sacred Money Blueprint, with the added benefit of sharing with someone who is going through the same journey as you. Your partner can provide valuable input your marketing communication, your numbers and your selling skills, and you can also collaborate and brainstorm in a way that enhances your understanding and application of the content. This way, you get to practise in the background whilst you start connecting with your real tribe, and it helps to make the process more effortless. It also means you can get going faster because without a partner, you would be testing this out with real prospective clients and learning through trial and error. When you meet with your partner, it’s important to have a focus so that you feel like you have achieved something specific at the end of the partnering session. As we move through the program, we become increasingly focused on creating financial results in your business, ie. sales. Bear this in mind when you’re working through each of the modules together, and ensure that you spend your time wisely on what is most likely to have an impact on your bottom line. In this process, be honouring of each other and the wisdom you each have. You don’t need to ‘fix’ or ‘advise’ each other, but simply give constructive feedback to help your partner to refine each aspect. It’s not about getting it ‘right’, it’s about exploring different ways to describe your business so that you can get comfortable sharing it when it really counts to be clear and concise. Keep it simple, and have fun! It is up to you and your partner to determine what to focus on in each session. Here are my suggestions to tie the content from each module together. 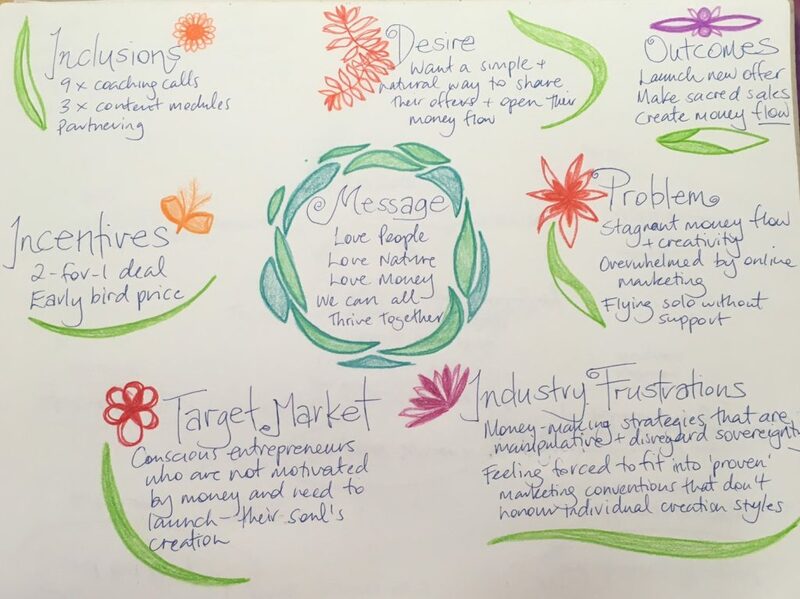 Create an ‘Offer Canvas’ by presenting all the key elements of your offer in a creative way (like the one above for the Sacred Money Blueprint). Use the key elements outlined here + your Message to describe your irresistible offer to your tribe. Allow your partner to ask questions about your offer until they feel crystal clear about who it’s for, what’s included and what makes it irresistible! Draw your Funnel sequence by stepping through each stage that your tribe goes through to becoming a paying customer. It’s a great idea to include the values, feelings or experiences you would like them to have as they progress through your Funnel. Ultimately you are creating a pathway for your tribe to follow and it’s important that you allow yourself to experience it from their perspective. Step your partner through the stages of your Funnel, describing what they will experience/receive and then ask for their feedback. 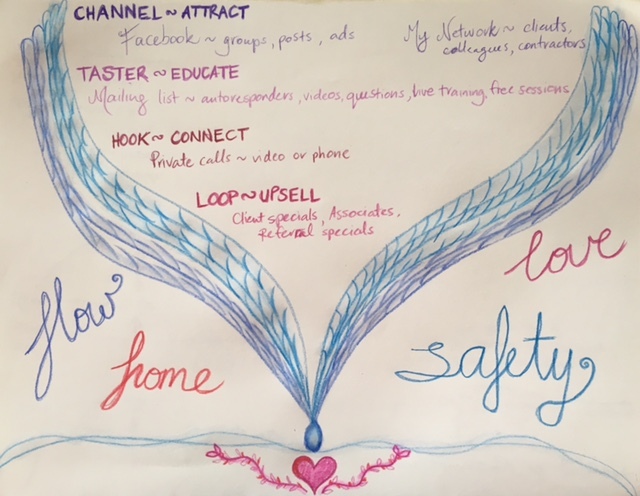 Draw the journey you are leading for your tribe to experience their Ultimate Desired Outcome, including where they are now and the key steps they need to take to get there. Feeling confident in this path provides a sense of safety and trust as you are speaking with your leads, and allows them to understand whether this path is for them or not. Use this as the foundation for your Sacred Sales conversation with your partner, ensuring that you offer a balance of information and receptivity for them to come to their own truth naturally. I recommend that you meet with your partner over Skype/Zoom or phone at least once in each cycle. And you’re welcome to share with each other in the Facebook group as well. Remember… Be imperfect in this process, have fun and learn as much as you can. That’s what partnering is all about!